In his monumental exhibition ?Everything Is Inside? 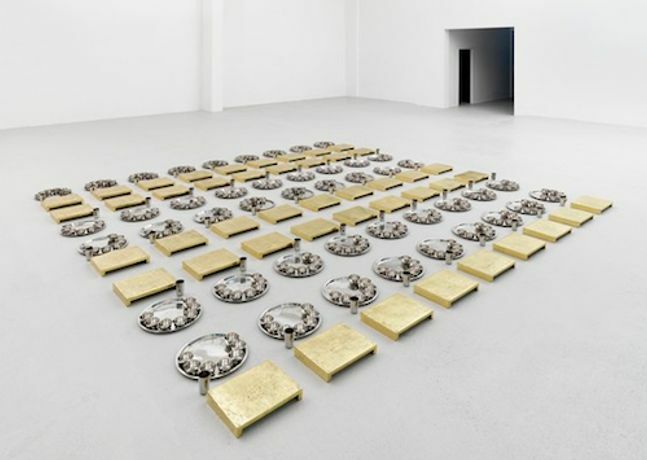 at the MMK 1, the artist Subodh Gupta (b. 1964) is showing bronze fruits, gilded bicycles, marble lunchboxes and gigantic installations of stainless steel dishes.The artist?s most comprehensive retrospective to date in Europe, the show reflects a contemporary conception of India as a society for which traditional values, spirituality and religious belief are just as important as the consistent pursuit of modernization and the related transformation processes in all areas of life. An aspect shared by all of the artist?s works ? from sculptures and installations to paintings and performances ? is their contemplation of local phenomena in a global context. For his art, Gupta employs everyday objects considered typically Indian and questions the cultural meanings attributed to them. With an oversize lunchbox made of marble, for example, he alludes to differing cultural imprints. Marble ? a luxury product in the Western scheme of things ? is a standard construction material in India, where it is used for the floors and bathrooms of the middle class. The themes of cooking and eating hold special significance within Gupta?s oeuvre ? a circumstance evident not only in the large-scale artworks consisting of kitchen utensils, but also in the Indian cuisine prepared in the exhibition for the visitors on every first Saturday of the month.